The Guardian culture professional network is a year old this September and yet it feels somehow like they have always been here. They slipped so neatly into the online hole in the sectors own communications and networking activities that it was a natural fit. That’s why when the super dynamic Nancy Groves asked me to step up and be interviewed onstage by their ‘mainframe’ arts editor Melissa Denes I said yes without hesitation. I am also a fan of David Sable’s work with NTLive and being onstage chatting with both him and Melissa seemed like a pleasure. there is little or no instructional memory now in the Arts Council. The leaking and plundering of staff has left then forgetting the lessons of their own failures and having to learn them all over again. Anyone remember ArtsOnline…? Reminds me of that wonderful line that Merlin utters in the movie Excalibur ‘it is the doom of men that they forget’. the ongoing lack of attention share online for cultural institutions (the actual branded sites from museums and galleries etc) does not automatically apply to artistic rich sites where there is no ‘brand’ between the audience and the stuff. They seem to have a more immediate relationship with the content that is outside of any institutional identity and is based on shared passions and interest. I wonder, are institutions ultimately hamstrung by their own internal need to justify themselves and build brand? If you are not a popular brand (NT, Tate etc) then can you ever break through this? I would love to do some deeper research into the successes of artist sites in the same way we have done for museums in the Culture24 Let’s Get Real work. Lois Keidan from the Live Art Development Agency had some great comments to make on these issues. as the funding cuts slowly destroy and undermine the arts funding infrastructure, they will not necessarily destroy creativity or creative output. Individual institutions may close but I believe that by far the biggest problem will come from having a political culture that is risk adverse and fails to value education and learning. As time passes, this is where we will fail to achieve the spaces for free thinking, provocation and genuine debate. Without those maintaining sustainability and relevance in any sector is pretty hard. there is nothing wrong with being an institution and having an internal need to justify your existence and build your own brand – if – you can be up front about that and stop trying to couch your online activities in a language of participation. trying to imagine the future is impossible as we can only ever construct it out of our understanding of the past. As such it is always a shiny, bigger version of what we had yesterday and can never be the fundamental behaviour changing experiences that we will in fact come to know. Check out the seriously mindblowing podcast of James Burke talking at dConstruct 2012 conference and read the transcript of Warren Ellis’s talk at the equally awesome Inspiring Reality conference entitles ‘How to see the future’. There is a great Marshall McLuhan quote that sums it up “We look at the present through a rear-view mirror. We march backwards into the future”. Thanks to Nancy, David and Melissa for a great evening and to the audience for being so friendly. On Tuesday 10th March, in a small conference room on the first floor of Smithsonian’s National Museum of American History, officials decided to find out if the story was true about the secret message supposedly inside Lincoln’s pocket watch. You can see all the pictures on the Museums Flickr site here. Above my desk is a poster that says “all artists are cowards”, it is an exhibition poster for an artist called Bob and Roberta Smith and every time I look at it I smile. Bob and Roberta Smith are one of the many new rising talents who have been chosen by Nicholas Bourriaud to be part of the Altermodern exhibition at Tate Britain. The conceit of the show is based on his naming what he sees as the next movement in contemporary art that replaces post-modernism. A post-post-modernism, that encompasses the global, networked, intercultural existence many of us now live in and some of us are immersed in. The show is funny, clever, curious and encapsulates something about the 21st century that has a real resonance. The wall paintings in Franz Ackermann’s installation are like looking at a networked digital space from the inside. They seem to map some strangely familiar visualisation of online spaces and the cyber journeying that takes us between digital information and its interactions. This idea of the (alter)modern journey comes also into Walead Beshty installation of Fedex boxes. These large glass cubes that bear the marks of their travels between the artist and a variety of destinations, are like the scars of environmental damage or the dangers of too much travelling on the human soul. The corners are cracked, the glass is broken and they seem sad, lost and rather beautiful. Loris Greaud installation (wires attached to boxes that resonate and vibrate the physical architecture of the room in time to flashing blue lights) seems to take you deep inside his head. But unlike the Ackermann paintings that seem to portray an internal digital space in a very public domain, this work takes you into the very intimate personal space of the artist’s own thoughts and brain waves. Bob and Roberta Smith is adding a new piece of work to the show each week. It’s creation starts with a conversation with the curator at 11am on a Monday morning which is then developed to becomes a new work to be placed somewhere in the gallery. Each new piece stays insitu for a week before being moved to a public storage area – a kind of art lost property area – where each piece can be moved aside. Each of the works possesses the same humour and cut-the-crap satire that I have come to know and love from my office poster. One expresses the regret “ I wish I would have voted for Barack Obama’ another simply states next to its found object sculpture consisting of a trumpet and megaphone ‘I was up all night making this’. There is a lot more worth seeing – the quietly breathtaking moonscapes by Darren Almond, Simon Starling’s replica desks that encapsulate the loss of detail and signal that comes over distances. You need at least two hours to do the show justice, of which at least 20 minutes is needed to watch Lindsay Seers ‘quasi-documentary’ about her own life as an artist and the impact that not speaking until she was eight had on her artistic development. In particular her time spend as both a human camera and projector. I left her projection space totally unsure if any of it was true but full of big questions about the nature of communication and seeing both inside and outside of us. You can also for an extra 65p buy a badge and be your very own Bob and Roberta Smith. I did and am. My iPhone has shifted into a new space with the download of a very cool little application, that is simultaneously totally useless and completely wonderful. 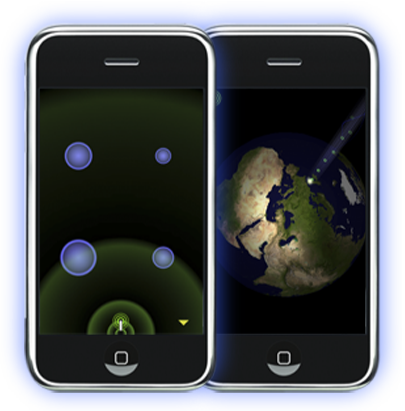 This is rather groovy and all good fun but the bit that I like the best is the interface to view the music of other iPhone players around the world, which are geocoded and visualized onto a rotating image of our planet. The effect is magical and reminds you of how small our world is, how insignificant our individual voices but yet how meaningful to us as human beings. This kind of visualisation of data that is being collected for ‘other’ reasons is I believe the start of something big. Exploding interface design is the thing that will finally transform the way technology can touch our lives in unexpected ways. This kind of mash-up thingy, useless exploration, is on the right track. If you have an iPhone, I suggest you try it and look at the user generated sheet music that you can play. 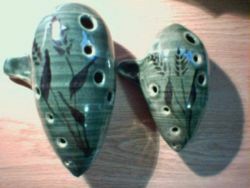 It is called Ocarina as the sound is like the real world instrument, as in the picture below.